Melbourne based G-Wagen enthusiast, John Kenny, started AGOA in 2005. John has owned many 4 wheel drive vehicles over the years but bought his first G-Wagen in 1998. Since then John has owned four G-Wagens and has gathered a large amount of experience and knowledge, either first hand or from other owners, both in Australia and around the world. 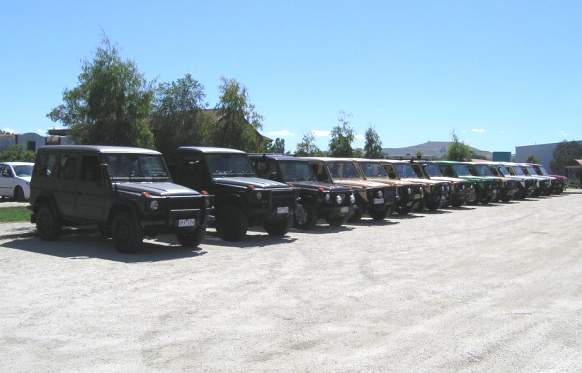 After seeking out other Australian owners on the worldwide online G-Wagen forums, John was convinced Australia should have it's own ‘club’ to share information, experience and resources on the maintenance and use of these vehicles. At that time we were aware that there were only 156 vehicles sold in this country and the ownership was spread throughout a very big country. This meant that the traditional type of car club was not viable – it is not practical to have monthly meetings when we are spread so thinly throughout the country and so we started a Register of vehicles and determined that the association of owners would be internet based. While initially we only communicated via Email we have now set up an AGOA Online Forum, which has become the main means of communication for members and non-members alike. You can access the Forum by clicking the link at the top of the page. To participate in the Forum discussions you will need to sign-up but there is no cost involved in doing this. The recent order of over 2000 Military vehicles by the Australian Defence Force (ADF) and the return of the G to the new car market over the past couple of years we are seeing a change to our membership as new owners of the latest 463 models join our ranks. While in no way affiliated with Daimler Australia or Mercedes-Benz Australia Pacific, AGOA has enjoyed a good relationship with the company and hopefully we can continue to build on that relationship. In November 2007, AGOA members arranged a Treffen (or get together) of vehicles to mark the 25th anniversary of the G. this brought vehicles from as far away as WA and Qld to Northern Victoria to celebrate this milestone (and mainly to ‘squiz’ at everyone else’s G) We did a climb to Mt Terrible (where the original press release was held in 1982) and generally had a weekend of G-related social activity. In November 2012 we will be celebrating 30 Years of the G-Wagen in Australia and will be returning to Mansfield in Northern Victoria on the last weekend of the month. Please see our Treffen Page for more details and keep watching the AGOA On-Line Forum for more details. This is primary function of AGOA. Basically it is the gathering of information on all known G Wagens and their owners in Australia. You will find a form on the Register page that will tell us details of your relevant vehicle(s) and a little about yourself. I would ask that all G Wagen owners at least complete the form. No private details will be published on these pages but I would like to share details via the post if you allow us to. Click on the link above to find out more.